A journalist suspended from the Independent for plagiarism has rejected a return to the newspaper. 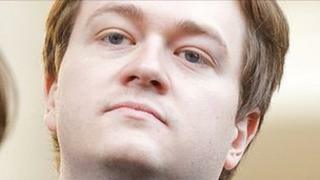 Johann Hari said he took the decision because did not want others to "take the flak" for his actions. Last week, the Independent's editor Chris Blackhurst told the Leveson Inquiry into media ethics that Mr Hari would resume his newspaper column after four months' unpaid leave. But Mr Hari said he would not take up the offer and planned to write a book. He said on his website: "I'd like to thank the Independent for the privilege of working for them over the past nine years, and for offering me my job back, starting in a few weeks. "But after nearly six months living in New York City, and plenty of time to reflect, I've decided to not take them up on their kind offer." Mr Blackhurst said: "Johann Hari has informed me that he has decided to leave the Independent to pursue his book project. "We thank him for his hard work and his contribution to the papers, and wish him every success for the future." Mr Hari was suspended in July while an internal investigation by Independent co-founder Andreas Whittam Smith into the claims against the journalist was carried out. The newspaper said Mr Hari admitted "embellishment of quotations/plagiarism" and to using a pseudonym to attack critics online. Mr Hari went to the US for retraining and in September returned his Orwell Prize for writing. The allegations against Mr Hari first surfaced in June when political blog DSG found an interview he wrote in 2004 which appeared to lift words from a 2003 book about Italian communist Toni Negri. The editor of Yahoo! Ireland and blogger Brian Whelan then randomly selected another interview written by Mr Hari and searched through the quotes. Mr Whelan said he found the Independent interview with journalist Gideon Levy had used quotes from an article in Israel's Haaretz newspaper. In response, Mr Hari admitted he took quotes from books and interviews by other journalists but said it was so that the reader "understands their point as clearly as possible". He wrote on his blog: "I stress: I have only ever done this where the interviewee was making the same or very similar point to me in the interview that they had already made more clearly in print." He said he had been subject to "trial by Twitter" and wrote an apology published in the Independent. Mr Hari, who was born in Glasgow and raised in London, left Cambridge University in 2001. He became a staff columnist at the Independent in 2002 and has also written for the New York Times, Le Monde, the Los Angeles Times and the Sydney Morning Herald.